These chocolate-chip sweet potato muffins are jam packed with healthy stuff like flax seed, chia seeds, cinnamon, almond flour (and you can freeze them!) but they taste great…so no need to mention this to your kids! We’ll just call it a muffin! When the boys woke up sick today, they wanted something nourishing, delicious and warm. I wanted to give them something healthy. They were also a little grumpy, plus they wanted to eat watching TV. Alas I dredged out of bed to bake them some healthy muffins. I always like to find great recipes and then modify them by reducing the sugar a little and adding a dab of something with more nutrients. 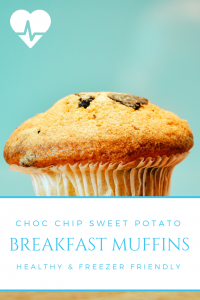 I usually start step by step to see how much the kids will tolerate and each time I make the recipe I’ll reduce the sugar a bit more and add a bit more of the good stuff…today’s muffin recipe is inspired by Good in the Simple. Roast enough sweet potatoes for 3 cups of mashed sweet potato (I placed 6 small, washed, pierced potatoes in a baking dish, covered in the oven for about 40 minutes on 375 with a bit of drizzled evoo and salt). Cool, mash until big lumps are gone and set aside. In another bowl mix the dry ingredients for the muffins: 1 cup white flour, 1 cup almond flour, 1 teaspoon chia seeds, 2 teaspoons of cinnamon, 1 teaspoon of baking soda, 1/2 teaspoon salt, 1/2 cup semi-sweet chocolate chips….mix well. In another bowl mix the wet ingredients for the muffins: 1/2 cup sugar, 3 large eggs, 1/2 cup avocado oil, 2 teaspoons bourbon vanilla…mix well. Combine with dry ingredients. Then combine with mashed potato. Spray muffin cups with coconut oil spray, and spoon 12 muffins from mix. 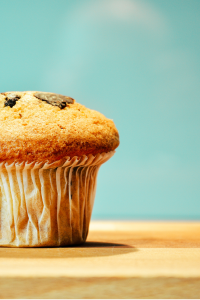 Top each unbaked muffin with a sprinkle of ground flax seed. Bake muffins for 30-35 minutes at 325. Muffins were DEVOURED. I will definitely double my recipe next time so I’ll some left to freeze! For next time I’m planning to toss carrots into the roasting pan alongside the sweet potato. And maybe a couple of pieces of cauliflower, too. I’ll also double the chia seeds and load up more of the ground flax on top. Yum!! Can’t wait to try this recipe!